Everyone likes a bit of romance, and here at Skydive Hibaldstow, we’re no exception! And what better way to celebrate with your loved ones than a special Valentines Tandem Skydive with a free bottle of Prosecco and a box of hand crafted chocolates. 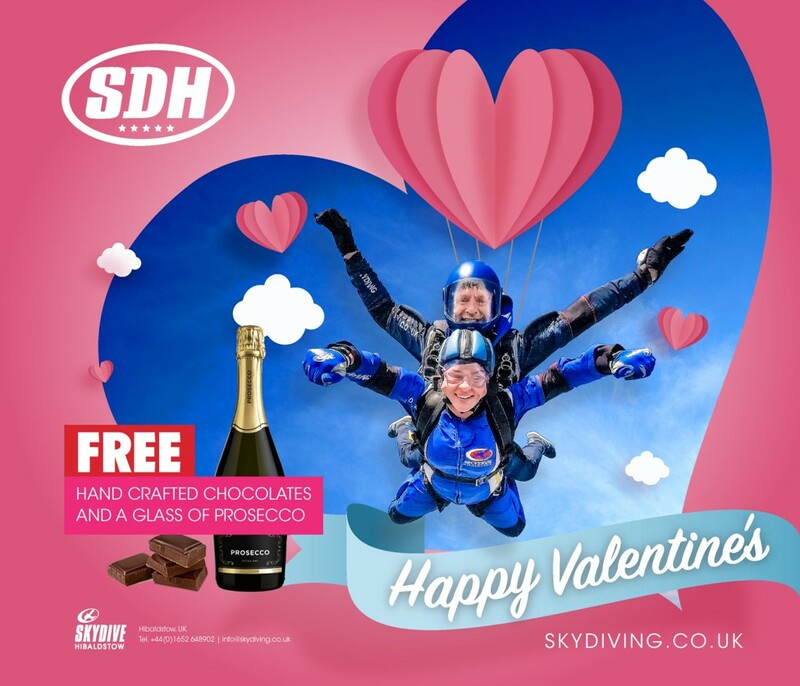 If you want to claim your free chocolates and Prosecco, then it’s very easy – make a booking for your 10,000ft or 15,000ft tandem skydive between the dates of the 13th and 15th February 2019 and when you land, your gifts of love will be waiting! To mushy? We don’t think so, you’ll probably need them if it’s your first tandem skydive! Making a tandem skydive is very easy. It starts when you arrive at the dropzone located at Hibaldstow near to Leeds, York and Hull. We’ll book you in and get you to sign some paperwork. If you’re doing a skydive with your partner, let the dropzone office know. They will do their best to get you both on the same airplane. Then comes your training where you’ll meet some of our tandem instructors. They will training you in everything you need to get out of an airplane – how to handle yourself inside, how to exit, what to do when you’re falling at 120mph, and the gentle ride down once the parachute has opened. Free falling with your instructor has to be the best bit, it’s so different than anything you will have done before!